BMS consultancy services to support the design, installation and operation of an intelligent control system. Many Building Management Systems under-perform, often as a result of poor specification design, poor control strategy, or inadequate staff training. Our BMS consultancy services mean you can have expert advice and guidance to help you install a new system, upgrade an existing one, or manage and monitor your system remotely. We offer independent BMS consultancy services to help you operate and manage your BMS. Whether you have an existing system that needs some attention, or design and installation of a complete new BMS, our consultants have both the qualification and experience to help. We’ll help you make the right choices for you to be able to manage your building easily and efficiently. 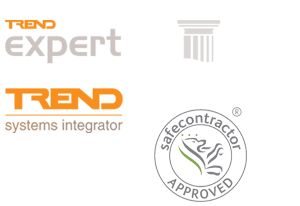 Our consultants are fully accredited by Safecontractor and Constructionline. Whatever the size and scope of your BMS project, we have the skills to take the necessary care needed to ensure strict health and safety requirements are met at all times. All of our consultants have many years’ experience and are highly trained specialists. We are approved partners of Trend, Johnsons Priva and Honeywell, ensuring that your work is carried out to the highest standard using only high quality manufacturers.